Close to the Gaji Tala towards north of Ganga is Kuthi Bari, originally built by Lord Hastings. 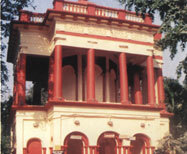 Rani Rashmoni stayed with her daughter and son-in-law in Kuthi Bari whenever she visited Dakshineshwar. Sri Ram Krishna used to reside at the ground floor of the residence between the years 1855 to 1870. Today a police camp in lodged here for the safety of the tourists. There are two Nahabat Khana in the Dakshineshwar Complex, the one at the southern garden is closed while the other is towards the west of the Kuthi Bari and north to the Kali Temple. Nahabat, an assortment of many musical instruments were played in the ancient times while today the temple authorities resort to only Dhak, Dhol and Kashi during the ‘aarati’. Just below the Nahabat Khana is the room of Sri Sarada Ma who resided here when she came to Dakshineshwar. Daily prayers are offered to her here. Chadni is the bank of the River Ganga which is situated in between the series of Shiva Temples. A flight of steps from the River Ganga leads to the Chadni where Sri Ramakrishna’s Vedantic guru Sri Totapuri alighted from his journey. avatar. 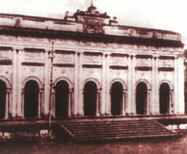 In the Nat Mandir in 1864 the ‘Annomeru Utsav’ was held by Mathur Mohan Biswas. Various religious songs like ‘chandigaan’, ‘jatragaan’, ‘Kali Katha’, ‘bhajan kirtan’, ‘matri sangeet’ and more are held here. In the temple premises, in the North West corner is the room of Sri Ramkrishna where he stayed for the last 14 years of his life. Sri Ramkrishna initially stayed at Kuthi Bari but at the demise of his nephew in Kuthi Bari he no longer wanted to reside there. It was on an occasion of renovation of the Kuthi Bari, he was allotted the room within the temple premises. 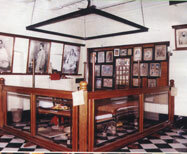 On completion of the renovation he no longer wanted to return to his original room and thus arrangements were made for him to permanently reside in the room which we call today the ‘Room of Sri Ramkrishna’. In 1872 it was here Sri Ramkrishna conducted the ‘Phalharini Kali Puja’ when he offered puja to Sri Sarada Ma praying her as the mother Goddess. Various articles used by Sri Ramkrishna are now exhibited. The pitcher that held Ganga water in his room is still found in its place. Sri Ramkrishna had an ardent group of followers like Swami Vivekananda and Keshab Chandra Sen with whom he had spiritual discussions here. During the ‘Kalpataru Utsav’ special puja is performed. It was on the 1st of Jan.1948, the 1st Kalpataru Utsav was held which the West Bengal governor Sri Raja Gopalacharya attended. 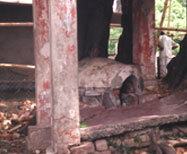 Close to Nahabat Khana is Bakul Tala Ghat where Sri Sarada Ma used to take her bath. The Bakul tree is not there but the river bank is exists and it is here Sri Ramkrishna’s guru Bhairavi Bramhani Yogeshwari Devi had made him a disciple of the ‘Tantra Sadhana’. 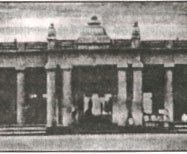 later rebuilt into ‘Shanti Kuthi’. Close to it is a Shiv temple with a Shiv linga where puja is performed everyday.